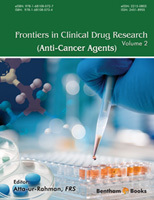 The present volume of Frontiers in Clinical Drug Research - Anti-Cancer Agents presents cutting edge reviews on developments in new and more powerful agents against cancer. The advantages that dendrimers offer as drug carriers are associated with their unique structure that imparts inner space and multiple terminal groups for drug encapsulation and conjugation. Hossain Sk and Kojima discuss the use of dendrimers as drug delivery vehicles for anticancer drugs. Cutaneous squamous cell carcinoma (SCC) is the second most common type of nonmelanoma skin cancer after basal cell carcinoma, and its incidence is on the rise. In Chapter 2, Nakamura et al. highlighted the importance of cytotoxic chemotherapy, immunotherapy and targeted therapy for advanced cutaneous squamous cell carcinoma. This review describes the previously published clinical trials for assessing the potency and efficacy of various approaches used for treating advanced cutaneous SCC. It provides the current evidence-based approaches and highlights the areas for further research. In Chapter 3, Jackson et al. discuss important developments in the field of pharmacodynamic biomarkers that have greatly enhanced the information obtainable from clinical trials and played a vital role in the development of pharmacokinetic/pharmacodynamic (PK-PD) models. The literature on the use of Bayesian systems in oncology (involving prior assumptions being made based on preclinical data and historical precedent) is reviewed. The applications of these models to develop strategies for new drugs, and to develop personalised medicine approaches in oncology are discussed. In Chapter 4, Ciocca et al. discussed the molecular approaches for targeting the Heat Shock proteins for cancer treatment. They discuss HSP90, HSP27, HSP70, and HSP60 as targets for anticancer therapy. A promising strategy to block inhibitors of apoptosis (IAP) proteins IAPs is with smallmolecule IAP antagonists. A number of small molecule inhibitors have been developed that have the potential to bring exciting new treatment options to overcome apoptotic resistance for anticancer treatment. In chapter 5, Arnst and Li have presented the recent advances and clinical challenges of targeting the inhibitor of proteins with some of the recently developed small molecule IAP antagonists. They have highlighted the biological mechanisms of IAPs and provided an update to the clinical challenges, recent advances and potential opportunities for small-molecule IAP inhibitors. Many substances present in fruits, vegetables and herbal essential oils have been shown to have important antiproliferative activity, inducing cell and genomic changes favorable for cancer prevention and therapy. In Chapter 6, da Silva and Salvadori highlight the importance of natural products as anti-neoplastic medicines. They stress that products that have natural origin are found to be more compatible with the human body and associated with fewer side effects. In the final chapter contributed by Doug Dix, the chemotherapy and chemotherapeutic paradigms are discussed in the light of modern challenges. The chapter describes the ways for overcoming tumor defenses, preventing treatment resistance, as well as how to preserve and enhance the host anti-cancer responses and lessen the severe side effects. I hope that the current volume of this popular Series will provide fresh insights into development of recent approaches to anti-cancer therapy for interested researchers and pharmaceutical scientists. I would like to thank the editorial staff, particularly Mr. Mahmood Alam (Director Publication) and Mr. Shehzad Naqvi (Senior Manager Publication) for their hard work and determined efforts.